Kiarra Saito-Beckman is a 10th grade part-time homeschooled student from Bend, Oregon. 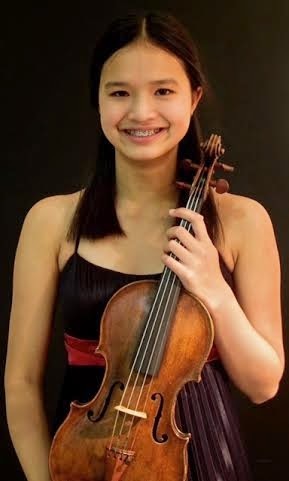 She studies violin with Kathryn Lucktenberg of the University of Oregon, and Jan Mark Sloman, former associate concertmaster of the Dallas Symphony Orchestra. She has won many awards and competitions, and was a finalist of the 2014 MTNA National Solo Competition, where she competed in Chicago in March. She was also named the PepsiCo National Young Artist of the Year as a result of being the first prize winner of the Charleston Symphony Orchestra National Young Artist Competition, held in South Carolina. Kiarra has been a guest soloist with the Central Oregon Symphony twice. She has also soloed with a symphony composed of members from the Oregon Symphony and the Oregon Ballet Theater Orchestra, and the Charleston Symphony Orchestra. This coming August she will be soloing with the Coeur d'Alene Symphony, upon placing second in their National Young Artist Competition. During the summer, she attends the Meadowmount School of Music in Westport, New York. She has performed in solo and chamber masterclasses with Jennifer Koh, Tong Wei-Dong, Steven Rochen, and Patricia McCarty.